Harry was about to walk out from Astoria&apos;s house after a long visit, but Astoria didn&apos;t want to let him leave. " Harry please don&apos;t go yet. We had a nice time" Astoria begged. Harry found it hard to resist, but he didn&apos;t want to leave Ron home all alone.
" I would like to stay Astoria, but Ron is home alone and I would be a horrible friend if I left him forever alone" Astoria giggled. " I talked to Pansy before you got here. And she&apos;s with him now so you don&apos;t need to worry about him"
" Come on, Potter " Astoria took a hold of his arm and dragged him. Harry was just about to walk in again when an owl flew towards him. " Is that Ginevra&apos;s owl?" Asked Astoria. Harry glared at Astoria.
" Don&apos;t call Ginny Ginevra unless you&apos;re her mother or something "
The owl flew down on Harry&apos;s shoulder and gave him a letter. " This better be good" Harry mumbled. He opened the letter and read through it fast. Astoria got worried when his eyes got wide open.
" What is it? Is it Ginny?" Harry shook his head. " It&apos;s Hermione. I have to go. I&apos;ll owl you, promise" He gave her a quick hug. Harry disapparated to Hermione&apos;s place in the muggleworld and knocked on her door. " Hermione? Open up!" Harry said worriedly. The door flew up and Hermione swung her arms around Harry.
" Harry..!" She gasped. " What is it?" Harry tried to speak clearly but Hermione almost strangled him with her bear hug. " I miss him so much" Hermione cried in arms. 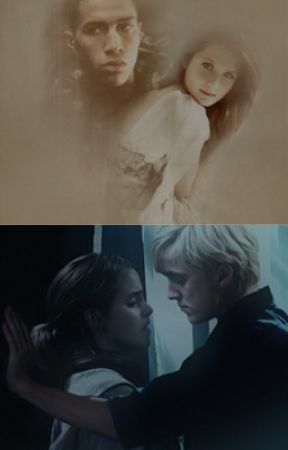 Harry sat down on the staircase with Hermione still in his arms. " Don&apos;t worry about it, he will come back soon"
Hermione shook her head. " No. I had a letter earlier today. And he said it will take a couple of weeks before we see each other again. Maybe months!" " What?! He didn&apos;t tell me that!" Harry said. " I don&apos;t even know where he is!" Hermione cried harder. " Do you?" " I wish I did. So I could kill him for making my sister cry like a little baby"
" Harry!" Hermione both giggled and cried at the same time. If that was even possible.
" Fine. First I let you meet him, then I&apos;ll kill him " " Agreed" Hermione chuckled. " I wish he at least could tell me what his mission was"
" I&apos;m sure it&apos;s something very important. I mean, he wouldn&apos;t leave you if it wasn&apos;t something super important " Harry said calmly. Hermione nodded.
" You&apos;re right I guess " Harry wrapped his arm around her and pulled her closer to him. He hated to see her like this.
" It&apos;s just..." Hermione sobbed. " It hurts so bad"
" I know Mione. I know "